When Francois Norbert Blanchet was growing up on his parents farm in rural 19th century Quebec, I wonder if he ever dreamed he would one day travel to almost every corner of the world! Born in September of 1795, near Saint-Pierre, Francois attended the village school for only three years before he and his brother Augustin were packed off to the Seminary of Quebec in 1810. He was ordained a priest 9 years later, and after serving in the cathedral for a year was sent to Richibucto, New Brunswick, as pastor of the Micmac Indians and Acadian settlers. The novice priest had to learn both the native languages and English in order to serve his diverse flock - which also included a small community of Irish settlers. He spent the next seven years traveling by canoe, dog sled, horse, and snow-shoe, enduring poverty, isolation, and innumerable hardships. He risked his own health tending the sick when a cholera epidemic struck the region. In 1837 he was recalled to Montreal by Archbishop Signay and appointed vicar-general for the Oregon mission, a vast territory never before visited by a priest, that embraced over 375,000 square miles ranging from California all the way North to Alaska, and from the Rocky Mountains to the Pacific Ocean. Blanchet set out from Lachine, Quebec on 3 May, 1838, traveling with the annual express of the Hudson's Bay Company, bound for Fort Vancouver. Their journey covered a distance of about 5,000 miles, and employed canoes, portages, barges, horses and mules (with and without wagons), and small boats. In Red River, they were joined by Father Modeste Demers, who would assist Father Blanchet in his duties. They spent nine days crossing the Rocky Mountains, on the summit of which, at three o'clock in the morning of October 16th, Father Blanchet celebrated Mass. They arrived at Fort Vancouver almost 40 days later. As he had in New Brunswick, Blanchet took to his duties with a zeal and determination that won the respect and admiration of the majority of the locals. Demers was no slouch either. Over the next four years, working virtually on their own, the two men managed a monumental workload, riding from settlement to settlement, winning new converts and calling lapsed Catholics back to the faith. They established their first mission the year they arrived, the second in 1840, just north of the Columbia River in the disputed territory. Unlike New Brunswick, where his efforts had won Blanchet the thanks and gratitude of even the Protestant population, their success in the west led to bitter charges by angry Methodist missionaries. In 1842 the workload eased some as he was finally joined by two other priests from Canada, the great missionary, Father De Smet, with four other Jesuit priests, three lay brothers, and six Sisters of Notre Dame de Namur. In August, 1844, he received letters from Rome confirming his appointment as the regions first bishop. To be consecrated he needed to return to Montreal; however, because it would be several months before the Hudson Bay's next trip east, on December 5th Blanchet boarded a steamer on the Columbia River, which docked at Honolulu, doubled* Cape Horn, finally landing at Dover, England. From there he went by rail to Liverpool, booked passage on a vessel to Boston and once again boarded a train which took him to Montreal, a journey of 22,000 miles. He was consecrated in the same cathedral, where he had served his first year, on July 25th, 1845. He soon began the voyage back to the Oregon mission by way of Europe, visiting Rome, France, Belgium, Germany, and Austria serving the interests of his diocese. On the way he gathered additional workers, including six priests, four Jesuits, three lay brothers, and seven Sisters of Notre Dame. They sailed from Brest, France in February, 1847, and reached the Columbia River in August. 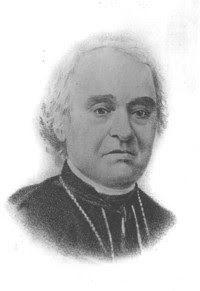 The region was elevated to a province on July 1st, 1846 and Bishop Blanchet was made Archbishop of Oregon City; his brother became Bishop of Walla Walla, and Father Demers Bishop of Vancouver Island. Arch-Bishop Francois Blanchet was no less zealous about his new office than any of his previous incarnations. The list of his activities would take some time to list; numerous councils, consecration of bishops, a book about his adventures in the fledgling Northwest, and a two-year trip to South America and, after the Jubilee Anniversary (50th) of his ordination, a trip back across Canada from Vancouver to Montreal, this time by the luxury of a steam-powered train. From humble beginnings on a farm in very rural Quebec, this Canadian blazed a trail through largely uncharted territory to become one of the most significant names in the history of North American Christianity. That fateful day, when he and Demers first arrived at Fort Vancouver, was November 24th, 1838 - 169 years ago this week. * Most people think Cape Horn is this jagged peninsula that juts out from the tip of South America. It isn't; it's actually the southern most island in an archipelago off the tip of the continent. Getting a square-rigged sailing ship around the tip of the continent involved finding a way through this group of islands as best one could given the weather and prevailing winds. Thus the goal was not "rounding" the Horn, but "doubling" it—in other words, sailing from 50 degrees south in one ocean to 50 degrees south in the other. Only then, hundreds of miles north of Cape Horn, could a ship be considered safely around. November 19, 1861: At the suggestion of her minister, abolitionist poetess Julia Ward Howe wrote "some good words to that tune" of the popular song "John Brown's Body." In February, "The Battle Hymn of the Republic" was published in the Atlantic Monthly and soon became exactly that. November 20, 1541: In Switzerland, French reformer John Calvin, 32, established a theocratic government at Geneva, thereby creating a home base for emergent Protestantism throughout Europe. November 21, 1638: A General Assembly at Glasgow abolishes the episcopal form of church government and establishes Presbyterianism, creating the Church of Scotland. November 22, 1963: British scholar and author C.S. Lewis dies. Because of the popularity of his Narnia series of novels the world might have taken more notice of his passing, were it not for the fact that American President John F. Kennedy was assassinated on this very same day. November 25, 2348 BC: According to Anglican Archbishop James Ussher's Old Testament chronology, Noah's flood began on this date.